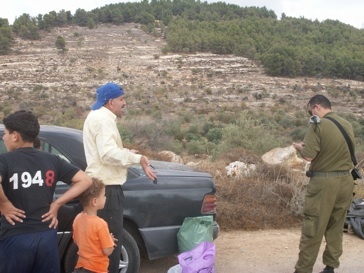 At approximately 10:40 on Thursday morning a Palestinian family from Azmut, in the northeast of Nablus, was harvesting their land near the illegal Elon Moreh settlement when a group of five settlers terrorized the family. 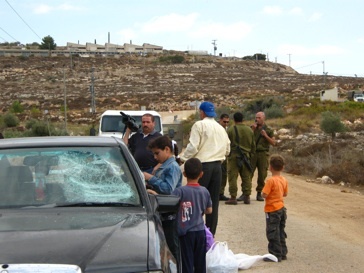 The settlers, wielding bats and knives, proceeded to attack the family car, smashing all windows and slashing all tyres, before retreating up the hill to the settlement. Handala Assus, the owner of the land was picking olives nearby with his family and five small children when the attack occurred. 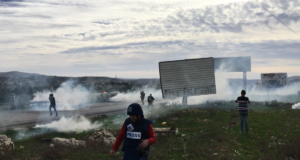 After shouting at the settlers, demanding that they stop, he quickly ran to the nearby Israeli army base to alert soldiers of the attack. He reports telling the soldiers: ‘Here they are! Come, come to help us’, while the settlers were still in the area. ‘They said to me, go away, go away’. 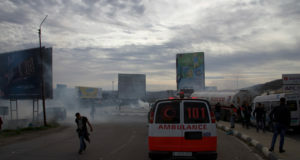 Assus then recalls that it took the Israeli soldiers more than twenty minutes to arrive at the scene of the attack, despite being just fifty metres away. The Israeli soldiers who did eventually attend the scene were not from the nearby base, and when questioned as to why the soldiers from the base had failed to respond one of the officers simply responded ‘I don’t know’. The Assus family, who were unable to finish their harvesting for the day were very distraught about the damage done to their car. When questioned as to the cost of the damage Assus could only shake his head sadly saying: ‘really I don’t know, really I don’t know’. 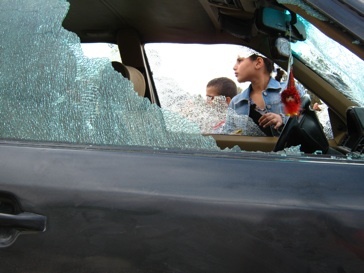 Others present on the scene estimated the damage to be in an excess of 5000 shekels. The family, however, seemed most distraught about the lack of response from the Israeli army whose responsibility it is to protect the Palestinians from this kind of attack. 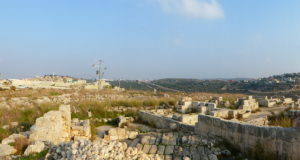 Despite Israeli police eventually arriving at the scene, one army officer stated that it would be the security guard hired by illegal Elon Moreh settlement would carry out the investigation. 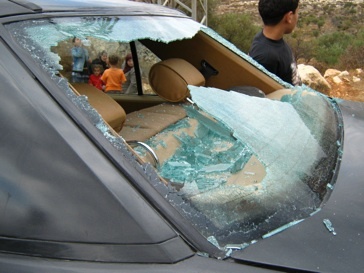 This is the most recent in a spate of attacks on Palestinians during the annual olive harvest. 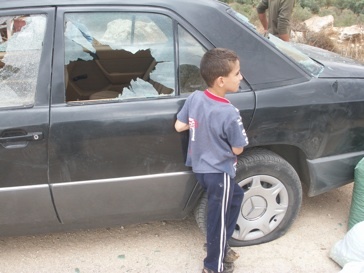 On Wednesday two cars were similarly damaged by settlers in Turmus’ayya; while on Thursday olive groves were burnt by settlers in Kufr Qaddum; and settlers from Yitzhar stoned farmers harvesting their olives in Burin.